The Los Angeles Angels have everyone’s top fantasy baseball player. However, there are more Angels to consider if you are playing fantasy baseball this season. For the Los Angeles Angels, 2017 is going to be an interesting year. The health and chemistry of this construction will be something that all major league experts will have their eyes on. However, there are some who enjoy fantasy baseball more than the actual game. Fantasy sports has a sizeable appeal with your team, or it’s another fun way to gamble in a $20 buy-in league. Want your voice heard? Join the Halo Hangout team! Fantasy sports has grown steadily, increasing every year with different ways and venues to play. Currently, I’m locked up in a fantasy basketball league where I am clinging to first place thanks to Stephen Curry, Karl-Anthony Towns, and Harrison Barnes. Nevertheless, fantasy has become a subgenre of sports in its own right. Bragging rights and extra cash are the motivation and fun behind picking a superteam based on stats. 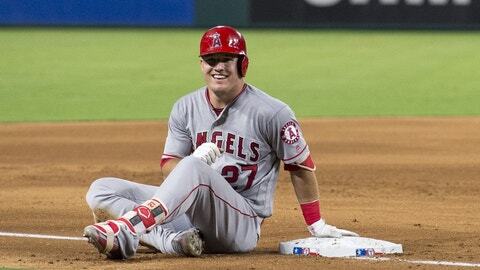 We all know the Los Angeles Angels have the projected number one fantasy player in Mike Trout. In fact, Fox Sports’ John Halpin has Trout ranked number one overall in his top 250 fantasy baseball player list. It’s likely that Trout will be selected number one in every league. However, the real question is: Are there any other Angels players that you should consider? Certainly, Albert Pujols should be on your radar. Pujols is coming off a 31 home run, 119 RBI season last year. Assuming he’s 100% by Opening Day, you have to grab him, especially if you’re in a deep league. While Albert Pujols doesn’t have a high ranking at 128, he still will provide strong numbers as he chases the 3,000 hits club. Interestingly enough, Danny Espinosa isn’t ranked on some experts 2B fantasy rankings. Now, I’ll agree, he’s not the best option; however, he’ll provide some decent offense for the Angels. Plus, he is the Angels “everyday second baseman”. The number one overall second baseball is Jose Altuve from Houston. Pitching is the biggest key to fantasy baseball, it’s also the weakest part of the Angels lineup. Garrett Richards slipped in his rankings due to injury last season. Also, it’s because of that injury he isn’t ranked high this season. However, he still remains the highest ranked Los Angeles Angel at 60. The honor of the number one pitcher goes to Clayton Kershaw of the Los Angeles Dodgers. As far as a closer, the Angels are going to have a three-man battle for that position prior to the season. Huston Street will get the opportunity to redeem himself following last season. Also, Cam Bedrosian will get a bigger role and the chance to prove himself. Both of these players are smart pickups. However, I would snag Aroldis Chapman if he’s available. Expect for Cameron Maybin and Kole Calhoun to be smart pickups if you’re struggling to find a decent hitter. If you are a trading machine throughout the season, having a Pujols or Ricky Nolasco could help you land that one player you couldn’t draft. However your fantasy season plays out, you can still use some key players from the Angels to help you get to the playoffs. Just remember, if you get the number one pick and you don’t choose Trout, you’re going to have a bad time.